For a console like M1, M2GO or Maxxyz Compact, an Ethernet cable from the EtherDMX port must be connected to a computer where the MSD 6™ is installed, and the IP of the computer must be set to an IP range of 2.x.x.x with subnet mask 255.0.0.0. 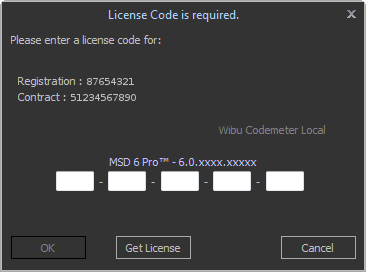 In other cases, make sure that the WIBU CodeMeter key is connected to your PC. If you already have an account with www.lighthouse.nl and the PC can access the internet then you can enter your username and password. 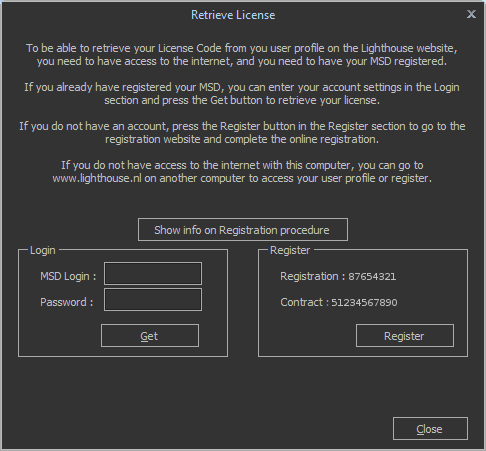 Click on the Get button to get the license code from the lighthouse website. If you don't have an account and the PC can access the internet then you can click on the Register button. This will start a web browser session with the lighthouse website registration page open. The required registration number and contract number will already be filled in. If the PC can't access the internet then you need to make a note of the registration number and contract number and use them on a PC that has access to the internet, to either create a new account on the lighthouse website, or add the contract to your existing account. click on the Register link in the left column MyShowDesigner, under Sign up now! Check the 'I have read and agree to the disclaimer / privacy statement' box. An email will be send to the email address you entered on the registration form, containing some information, and an account activation link. You have to click the link to activate your user account. 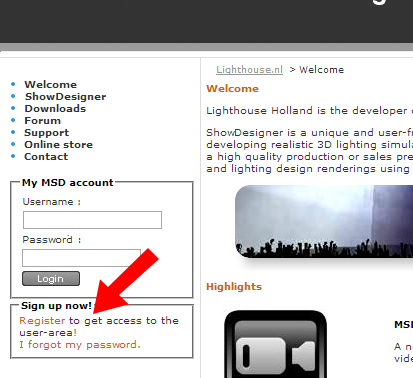 When this is completed, you can Login on the Lighthouse Holland website. 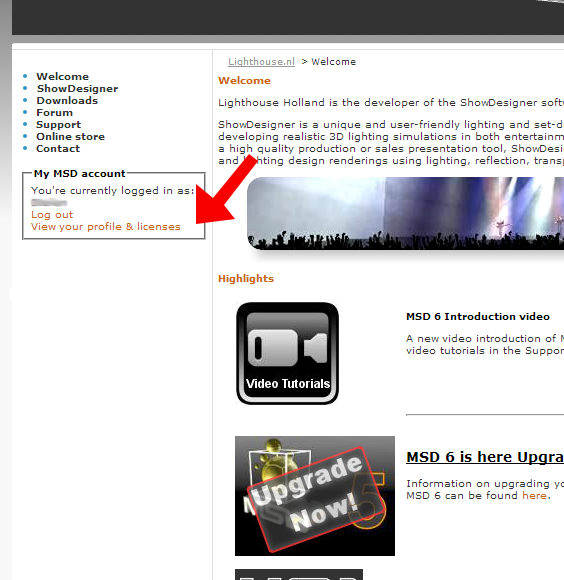 You can do this using your Username (Login name) and your Password, in the left column MyShowDesigner, above the Login button. To find your license, click on the View your profile & licenses link. Scroll down to the Registered Dongles section. The license code will always be available in your online profile on the lighthouse website. If the registration is not there yet, enter the Contract	number and Registration number, and a License will be generated. Note: the first time the MSD 6™ is registered it will ask for the license, after that the license is stored inside the WIBU CodeMeter key. The MSD 6™ can be installed on as many PCs as desired, it will start without asking for activation code as long as the license remains valid.